Some of you might remember the Chobani yogurt review and giveaway by Momma Lew's Blog for a few weeks ago. 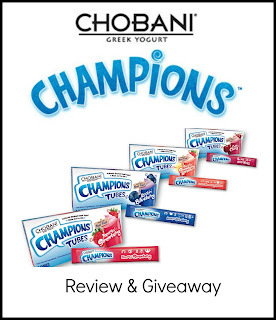 Now it's back, but this time it's Chobani Champions, which is just for kids! My family and I have been fans of Chobani Greek yogurt for many years now. My children have really taken to love eating the Chobani Champions Tubes! We recently had the opportunity to review some Chobani Champions in Chillin' Cherry, Jammin' Strawberry and Rockin' Blueberry! Chobani Champions is an authentic strained Greek yogurt made exclusively with 2% milk, making it a great source for your children to get their daily Vitamin D, calcium, and protein! It's smooth, creamy consistency makes for a healthy snack for any kid in mind! My children don't care for fruit chunks in their yogurt, so the kids really like the Champions for this reason. The 2.25oz tubes make a perfect addition to school lunches or picnics. Champions, like all Chobani products, are completely all-natural. Chobani uses real fruit all of their yogurts and all of their products are naturally gluten-free with no thickeners or flavorings. Each tube contains 3 types of probiotic cultures, helping to keep your child's immune & digestive system top notch! One of our favorite ways to eat our Champion Tubes is by freezing it! The kids love push pops or freeze-ice tubes, so this is a perfect way to give them a healthy treat! You can keep a Champions tube frozen for up to 3 months. Also, they are perfect to put into lunches frozen. They dethaw as the day goes on and then you have a cold yogurt snack! 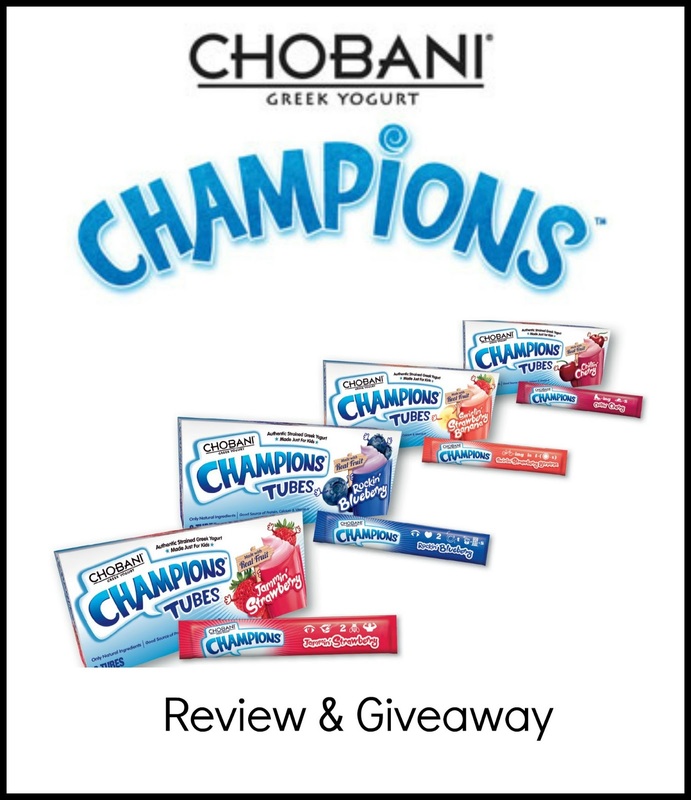 Click Here for a $1.00 off coupon for your next purchase of Champions! Check out my review of other Chobani products! Do you and your children love some CHO as much as we do?? Good! Chobani is giving away a case of Chobani Tubes! The giveaway will be open to all US Residents, 18 years of age and up. To enter, simply follow the steps in the Rafflecopter below!